Saturday morning arrived chilly and frosty. Mist from Mosquito Creek had covered everything in a heavy frost; my tarp snowed when I shook it. I was sore and slow getting around and the group left about fifteen minutes before I did. That was fine, I kind of wanted to do some solo hiking. I followed the Bridge Trail up along the creek and it was beautiful with large boulders and several rapids along extensive meadows. The trail left the creek and climbed through a meadow, offering a wide panorama of distant meadows, forests, and large ledges as Mosquito Creek flowed in the distance. 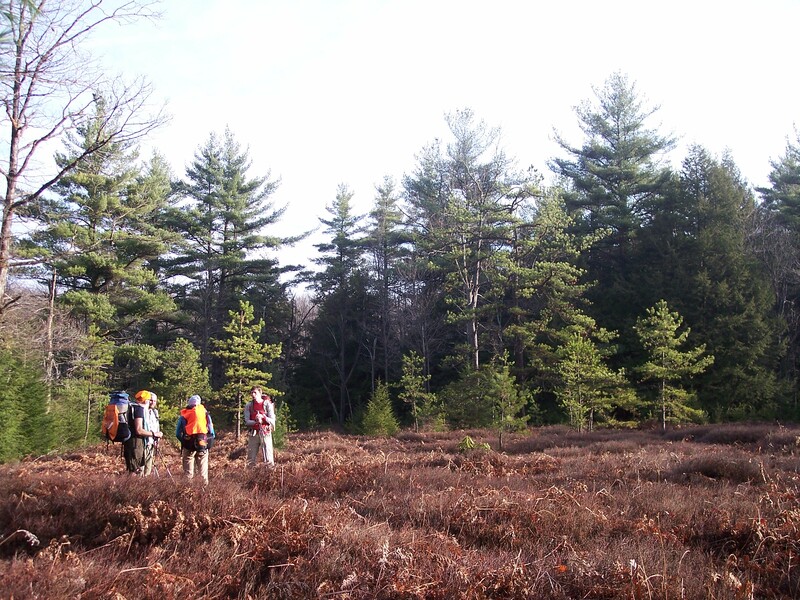 The meadows were comprised of teaberry, lowbush blueberry, and ferns. It easily reminded me of Dolly Sods in West Virginia. The photos don’t do it justice, it was a highlight of the trip. The trail passed more meadows and meandered above Beaver Run, with a large beaver pond below. I soon reached the Beaver Run Shallow Water Impoundment that offered a perfect reflection of the forest. I decided to take a different route, so I went east of the pond and saw a blue blazed trail. I took it to a shelter for birdwatchers. I then noticed a yellow trail, so I took that, and it meandered through a beautiful pine forest; it was like walking on a pillow with all the pine needles. It soon rejoined the cross-connector trail; this trail I took was the Lincoln Loop and it was a nice hike. The trail crossed more meadows and then entered thick laurel before rejoining the Quehanna Trail. The trail went through a series of big rocks and dropped into two drainages briefly before passing a view and dropping steeply to Mix Run. During this descent I slipped on the leaves and fell down. Mix Run was another nice creek that grew more scenic as I hiked up it with cascades and even a small hidden cabin with a “yard” of moss that reminded me of somewhere the seven dwarves from Snow White might reside. It was back up to the plateau and to my next favorite section, the headwaters of Sullivan Run with a stunning forest of pine and hemlock- it was so green and dark. Then it was down pretty Silver Mill Hollow along an old grade and across some log bridges that bowed when you stepped on them. Thankfully they didn’t break since the creek was almost ten feet below. The next section was frustrating- the sidehill around Haystack Mountain. It was narrow, worn out, and a little treacherous. Plus I was tired. All the work to dig this sidehill lead to nowhere particularly scenic and it climbed up the mountain, than down, and then to a parking lot off the Quehanna Highway. The sidehill resumed and it began to tick me off- they should re-route the trail because this section was pointless. It was dark so the headlamp came out, and it was tough to find the trail blazes. At least I was near Medix Run, where we were to camp. I finally reached Medix Run where a man was camping in a primitive campground. He said my group decided to camp further down the trail, along Bear Run. He then offered a beer, hot dog, and a place to camp if I wanted too. I was tempted, but politely declined. I headed on into the darkness. I found the amazing bridge across Medix Run- this thing is a huge, arched footbridge and impressive in its own right. I wish I had a picture of it. I began to climb up Bear Run and soon reached our campsite. I set up the tarp, ate, and went to sleep. It was a 19 mile day. The next morning, Sunday, was warmer, as the sun glowed to the east and mist hung down in the valley. I was up early and on the trail first. I climbed up Bear Run and crossed the plateau to another view and then down to Laurel Run, with some views of this large and scenic stream. After a roadwalk, it was back in the woods along Saunders Run, which grew more scenic as you hiked up with big boulders and small waterfalls. By noon I was back at my car and changed my clothes. It was a 10 mile day. This was a great hike. Sections of this trail are truly impressive, with some of the best scenery on the side and connector trails. 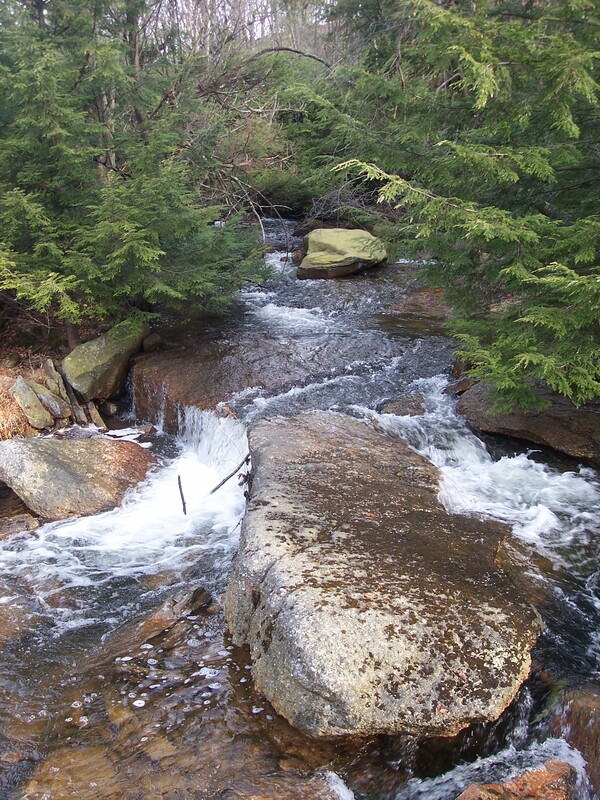 Most of the streams are incredibly beautiful, as are all the meadows, bogs, and forests of pine, hemlock, and spruce. Be sure to check out the Bridge Trail and Crawford Vista, they are not to be missed. Few trail systems offer so many options and so much different scenery. Although we failed to see any elk, it was still a memorable hike. 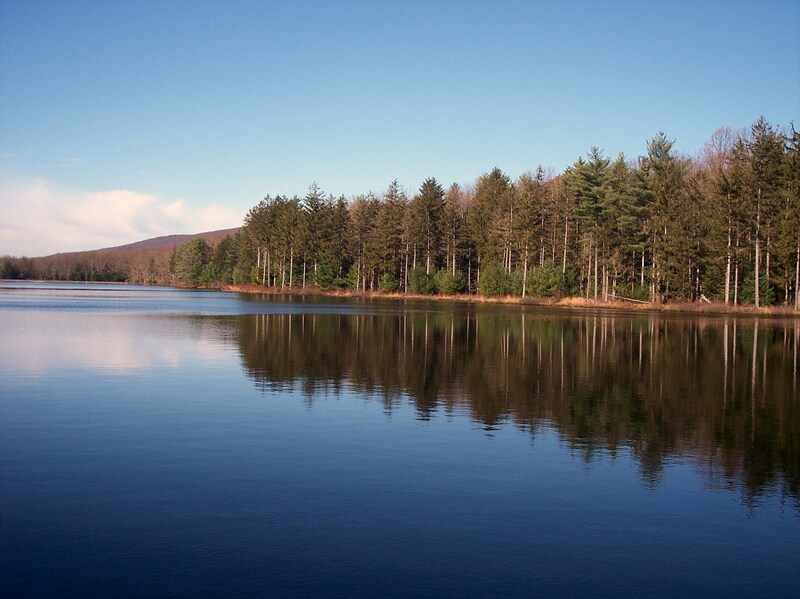 Visit the Quehanna, you’ll be glad you did and you’ll find yourself coming back. The Quehanna Trail is one of Pennsylvania’s finest. It is a loop over 70 miles long, with over 30 miles of cross-connector and side trails. 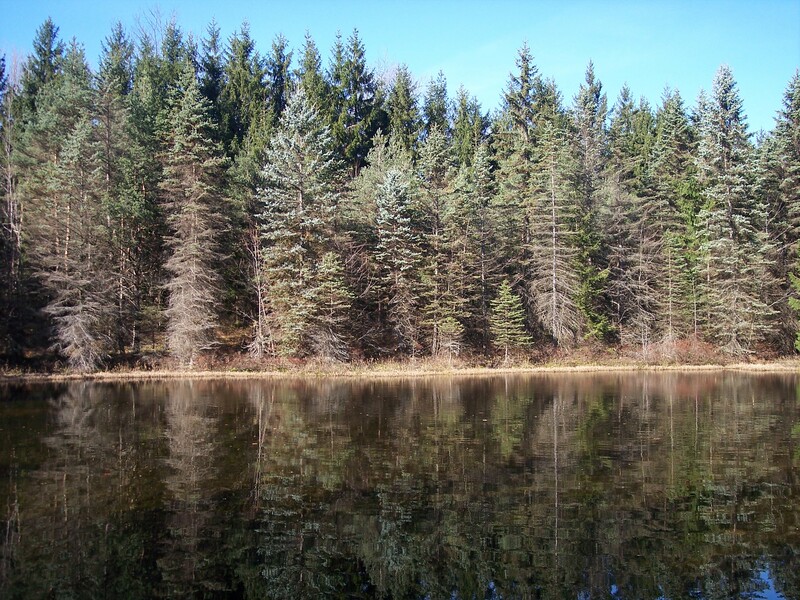 These trails are located in the Moshannon and Elk State Forests, near Clearfield. What makes the Quehanna so unique is its isolation and wilderness qualities, a great diversity of plants and animals, including elk, and a wide spectrum of scenery- from bogs, to large meadows, huge boulders, and cascading streams in hemlock gorges with jungles of rhododendron. What I love about the Quehanna is its water. It teems with water, and its streams are crystal clear, cold, and deep as they meander through meadows. Often, the streams have a bed of white sand. This past weekend I was able to hike 54 miles of this trail system over two and a half days with some friends from Ohio. I pulled into the parking lot at Parker Dam at around 9 p.m. on Thanksgiving night. Amanda and Kevin had also arrived and I saw their headlamps in the woods. We greeted each other as I got my things together and soon we were off, as our headlamps tunnelled through the night, only offering a glimpse of what was in front of us. The roar of creeks echoed through the woods. We reached a clearing and turned off our handlamps; there was an incredible panorama of stars and constellations across the sky. The trail was wet in many places and we had to negotiate a few stream crossings. Soon we reached the campsite along Little Laurel Run where a fire was going thanks to two other members of our group. I set up my tarp, my first time using one while backpacking, and soon I was asleep. We got up the next morning and were on the trail by 7:30 a.m.; we had a big day. The trail was beautiful as we climbed in and out of stream drainages with meadows, forests of hardwoods, spruce, pine, and hemlock, and gorgeous crystal clear streams with small cascades and deep pools. The trail even crossed a bog over a boardwalk. Alex Branch was a wonderful hike with rhododendrons, as was the climb to a meadow with some nice views in the hazy sun. I then descended to Trout Run, a stunning stream in a valley with large boulders and another clear mountain creek filled with rapids and cascades. The trail followed up another creek with a forest floor covered with ground pine. Rick (aka Handlebar) caught up to me and we hiked together, in and out of valleys with streams and views of meadows and beaver ponds. 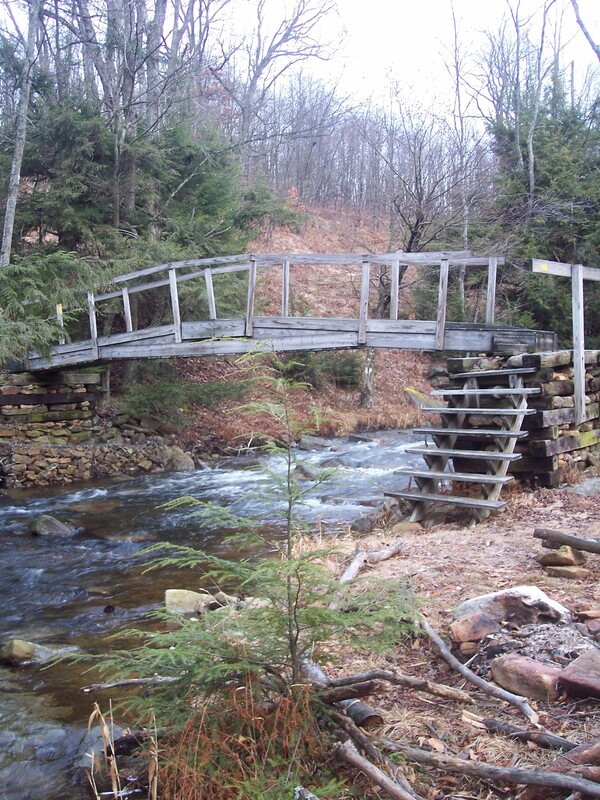 The one unique thing about the Quehanna are all its different trail bridges- some are planks, a group of branches, logs sawed in half, or grand affairs with steel girders and arches. We hiked along Gifford Run, one of the larger streams with more rapids and big boulders. Huge cliffs were off to the left, but we decided to skip the side trail that led to a view. We reached the forest road and hiked down to Mosquito Creek. We followed Meeker Run and took another trail to Crawford Vista, with a fantastic view of Mosquito Creek’s deep gorge from a meadow. The sun had set and the clouds grew yellow and red. We began to hike in the dark and turned our headlamps on. The trail crossed an impossibly boggy section as we jumped from tussocks of grass over water and then we hiked back down to Mosquito Creek between boulders in the darkness. We reached camp; there was a fire and it was cold with frost already covering the ferns and teaberry. It was a superb campsite next to Mosquito Creek. I set up the tarp and ate some food. I was really sore- it was a 23 mile day with a full pack. I crawled into my sleeping bag and went to sleep to the sounds of the creek. The Poconos harbor some of the most impressive waterfalls in the Mid-Atlantic. Here, water gathers on top of the plateaus, creating extensive wetlands, ponds, lakes, and bogs. Creeks drain these wetlands and flow towards the Delaware River, as they do, they cascade down the plateau. A great illustration of this is on the Pennsylvania side of the Delaware Water Gap National Recreation Area. 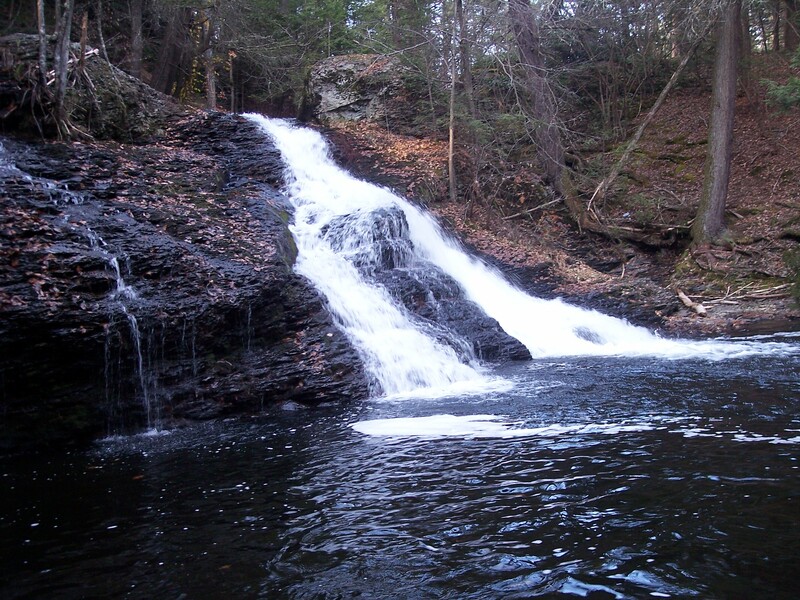 Raymondskill, Dingmans, Adams, and Hornbecks Creeks all feature superb waterfalls, with some over 100 feet high. While Hornbecks Creek does not feature falls as high as the other streams, it may be the finest waterfall hike in the area. 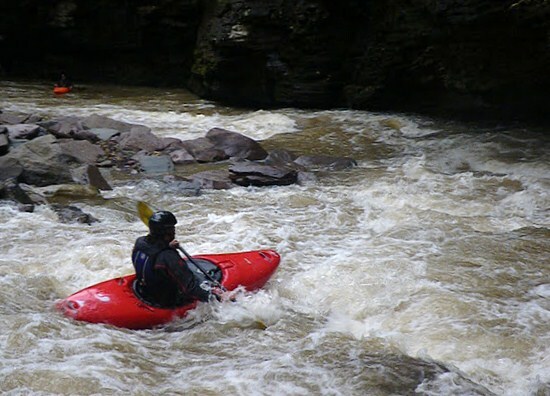 It is also beloved by whitewater kayakers, who have come from far and wide to run its falls and rapids. We began by hiking up from US 209; the trail is obvious, but there are no blazes. The first bridge was intact, but not the second, which was washed away by floods. After a tricky crossing, we continued on. Most of the trail was passable, but there were several blowdowns, and a few places where the trail was washed out. We soon reached the first falls- a huge slide surrounded by cliffs that plummetted into a huge pool. Above was a chasm and many smaller falls- the creek was really gorged in. Hemlocks surrounded the creek, but they were clearly affected by the woolly adelgid. The creek is incredibly beautiful as leaps from ledges between small, deep pools. The trail hugs the side of the gorge along narrow sidehill. We soon reached a huge, multi-tiered falls that was just stunning. It is known to paddlers as Goliath Falls. The trail then follows a staircase to the top to another chasm that is so deep it is hard to see the creek. The chasm holds more smaller waterfalls and chutes; it is adorned with moss and ferns. We soon reached the top with one more falls that dropped into another deep pool. The total hike is 4 miles; although the trail itself is not particularly hard, the narrow trail does traverse some steep terrain and cliffs above the waterfalls. 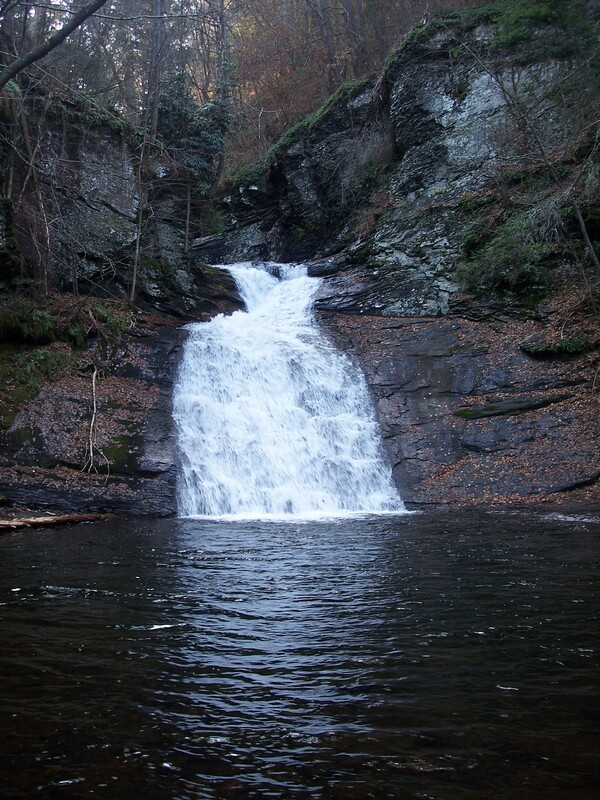 Hornbecks Creek is one of the most beautiful places in the Poconos and the Delaware Water Gap National Recreation Area. It is one place worth the effort to hike. After running Bennetts Creek, we were all excited. Bennetts is a quick paddle, only a mile or so long, so we were looking to do something else. So we loaded our boats, piled into our cars, and we were soon off to the South Branch Towanda Creek. If you’ve ever driven along US 220 between Towanda and Dushore, you’ve seen the South Branch Towanda Creek. It is rarely paddled. We reached a pull-off and began to unload our gear as a neighbor from the house next door came over and talked with us. He was friendly as we talked about the creek. After running shuttle, we carried our boats down the bank and to the creek. The water was cold, and still brown from the floods. The creek began with easy rapids and riffles between pools. Traffic from US 220 could be heard overhead. 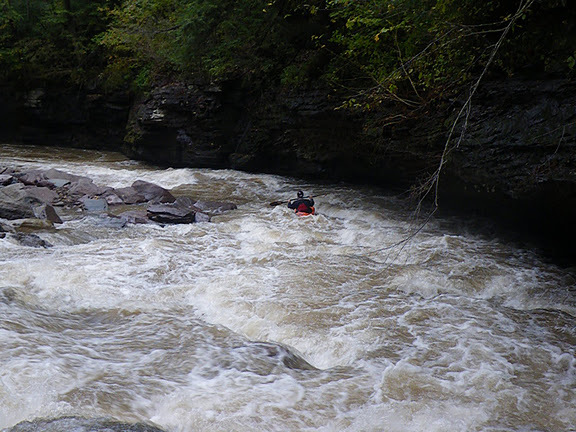 Soon the rapids became more frequent as hemlocks began to cloak the steep banks. Since this was after the floods, we had to keep an eye out for any fallen trees. The creek soon entered an incredible chasm or gorge, and it was stunning. Black rock ledges, slicked with spring water, rose over the creek, and the roar from the rapids grew louder. These ledges were undercut, as they reached over the creek. On the other shore was this amazing old fieldstone retaining wall for an ancient railroad. It must have been over twenty feet high along the creek; the work to build that, stone by stone without concrete or mortar, is hard to believe. And considering the floods, much of it was still intact, although a section was washed away, revealing the ribs of the old railroad ties above. These remnants from our past are always fascinating. We got out of our boats to scout a rapid. This one was rocky, with stones sticking out here and there and it curved to the left along a ledge. Below was a swirling, whirlpool eddy. We all bounced down through the froth and reached the pool below, which whisked us around and around. We were all amazed by the scenery, thinking it was the Lost World as the chasm walls rose over us, encasing us with the creek. The chasm receded and the creek opened up, but there were still plenty of fun rapids; the mountain scenery was also great, with Brier Mountain rising over a thousand feet above us. Much of this creek is undeveloped, with only a sporadic home or cabin. We reached another long ledge rapid, which was partially blocked by a fallen tree. I walked the top part of the rapid, but ran the rest as I plowed through the waves below. One last ledge rapid remained, it was about 3 feet high and dumped into a pool. The creek was fun and beautiful to the end. We got out before the gun club and then got a bite to eat at the Wyalusing Hotel. The south branch is a beautiful creek and one I was glad to finally paddle. The next time you’re driving and see a creek, there might be more down there than you can imagine. This past weekend I visited the Roaring Creek Tract, which is a part of the Weiser State Forest. This tract covers about 10,000 acres and was once land owned by a water company. A few years ago it was transfered to the state to become part of the state forest. The reservoirs and dams are still owned by the water company. I visited this tract a few years ago, but have wanted to return to check out its network of trails. There are over 40 miles of trails that interconnect; there is also a gated road, the Roaring Creek Trail, that bisects the parcel west of PA 42 that is very popular with bicyclists and those who walk. The other highlights are three reservoirs that are almost completely untouched, including McWilliams Reservoir, to which you can only hike. I began at the large parking area at Klines Reservoir under sunny skies. I began by following the Headwaters Trail on the east side of PA 42. The woods are mostly mature oaks and other hardwoods, although there are places with hemlocks, which appear mostly healthy. The trails are blazed red and most trail junctures have signs. I passed the Old Reservoir and Corduroy Trails to the right, and both looked beautiful with thick hemlock and pine forests. I followed the Headwaters Trail and passed a large spring that could be a nice campsite location. I reached the eastern boundary of the tract and headed south. Here, the map did not seem accurate. The sign posts indicated the Headwaters Trail went to the top of the ridge along the eastern boundary, but the map says the Homestead Trail follows this route. Further, there are several other trails not on the map. I climbed the ridge and passed the Big Mountain Trail; I pushed further to the top and reached the Ponds Trail, where I turned right. This is a trail not to be missed. It is often covered with moss, and goes through a forest of white birch, pine, and laurel. The highlight are two small ponds. The first I reached was crystal clear and deep; camping was possible here. The second was smaller, but also very nice. The Pond Trail passed other trail junctures through a pine forest. I crossed a small stream and reached a juncture that was the end of the Headwaters Trail. I turned left onto the Dark Woods Trail. It was also a very nice trail with hemlocks, pine, and laurel. 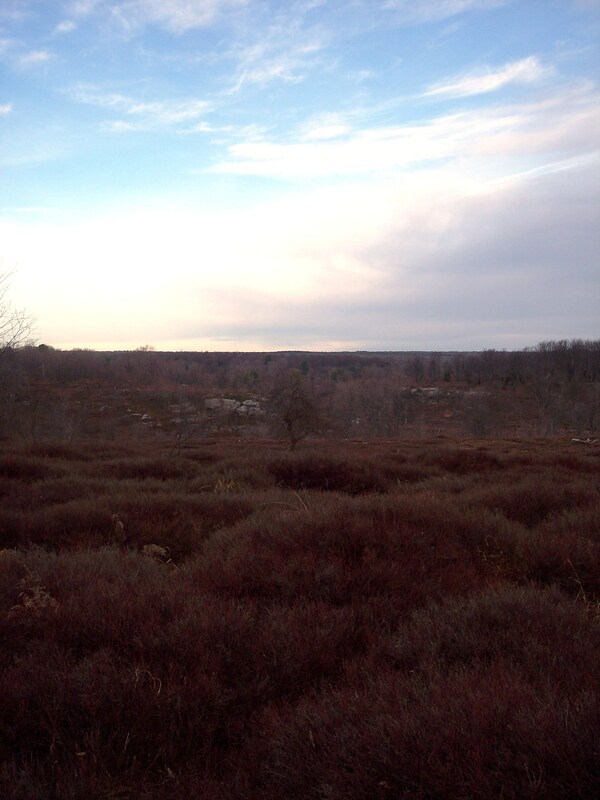 There was also a huge vernal pool. I soon reached the second parking are along PA 42. I crossed the road and entered a pine plantation. I then followed the trail into an area that was cleacut, the only not-so-scenic part of the hike. I should’ve followed the gravel road off to my left instead of the trail. As I was hiking, I heard something in the brush, maybe 15 feet away. I thought it was a squirrel. I looked over to see a big 8 point buck. I was startled and fumbled for my camera. The buck soon caught my scent and bolted, but I was able to get a picture of it. I followed the gravel road to the Pump House Trail and followed that down the ridge back towards Klines Reservoir. Along the way were some ruins. I reached the Roaring Creek Trail at the dam for the reservoir and followed the trail towards McWilliams Reservoir. I soon reached McWilliams under overcast skies. This is a large and scenic reservoir. I crossed a bridge at its inlet and followed a trail along the shore with spruce and some rhododendrons; this section did not have any blazes. I eventually turned around and turned left onto the South Branch Trail, which joins near the bridge over the inlet. This trail had infrequent red blazes and was not that well established; tape tied to trees helped guide the way. 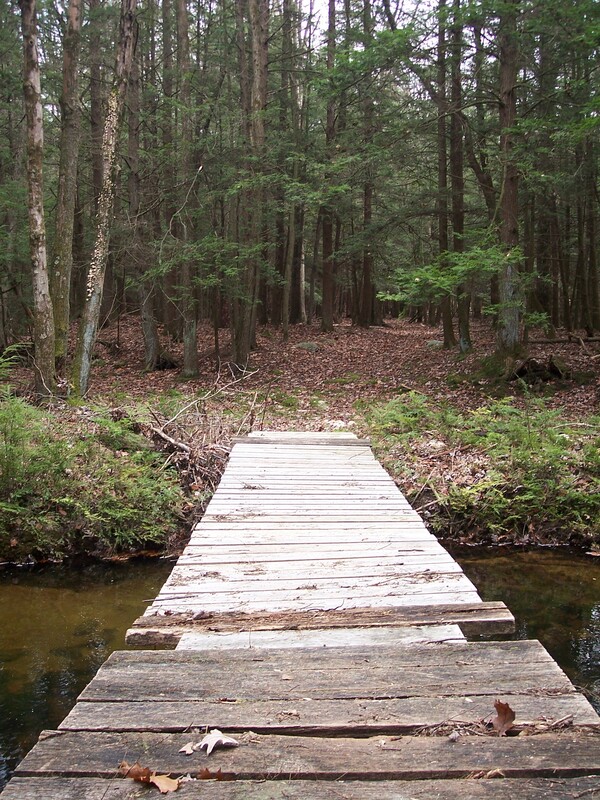 But the trail soon reached a footbridge over Roaring Creek in a beautiful hemlock forest. This would be a nice place for camping. I soon reached Roaring Creek Trail again and walked back to my car. Roaring Creek Tract offers many trails and countless options. I want to hike more of the trails west of PA 42. Overall, the scenery is good and most of the forests are attractive. It could be a good venue for backpacking, but I did not see any established campsites. 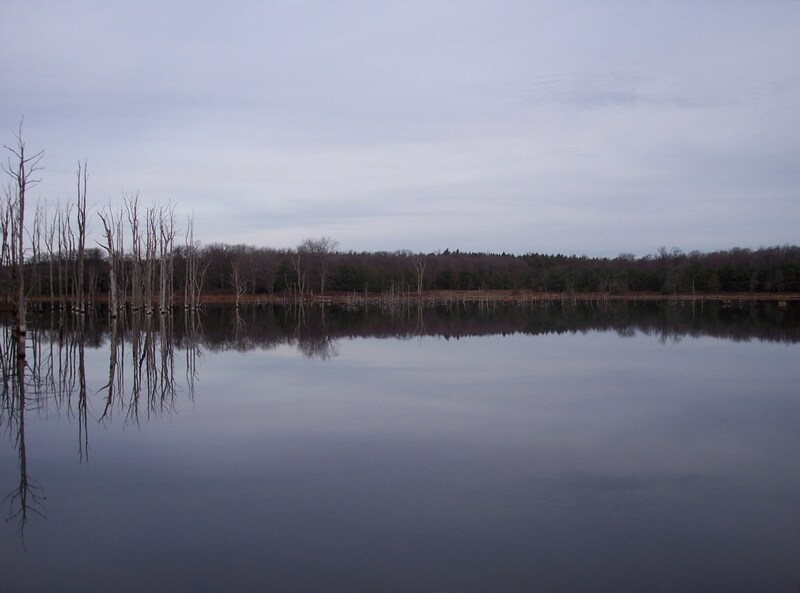 The reservoirs are very scenic, as is Roaring Creek, and the ponds. It is definitely a place worth visiting. The tract is about 20 minutes south of Bloomsburg, on PA 42. 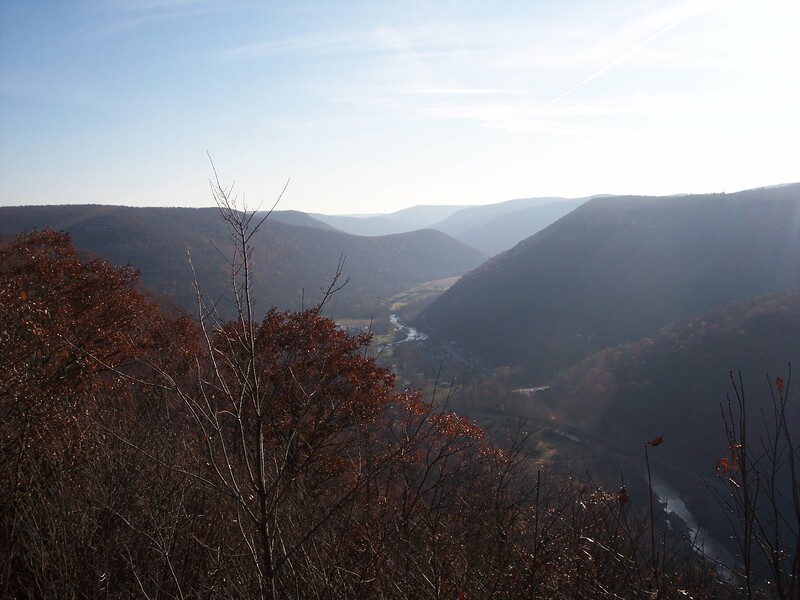 The McIntyre Wild Area encompasses over 7,000 acres and is located in the Loyalsock State Forest, near the small town of Ralston. 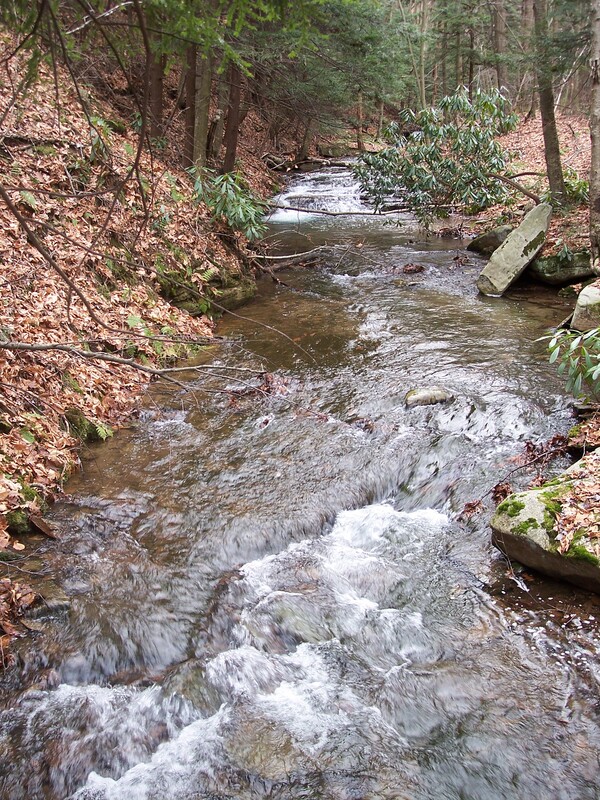 It is just north of Rock Run, widely regarded as Pennsylvania’s most beautiful stream. This is one of my favorite wild areas- it’s streams feature many waterfalls; there are big rocks, boulders and cliffs, scenic forests, and history. In fact, the mining town of McIntyre was located here. Today, only the cemetery exists. The town band would play at Band Rock and residents in the valley below could hear the music. Even today, you can see the evidence of the mining era, such as mounds, depressions, fills, and old foundations. Ironically, the forests have largely healed what was once mined, with scenic forests of pine, hemlock, spruce, tamarack, and hardwoods. I’ve been to the wild area before, but on this trip I wanted to explore some new places. Leigh Ann and I drove to the parking area off of McIntyre Road and I followed a trail through thick spruce to a hidden pond, covering an acre or two. The pond was surrounded by spruce and was crystal clear, but appeared shallow. What was most interesting was the moss- it formed a carpet throughout the spruce forest. We picked up an old forest road and reached a meadow with several tamaracks growing, the only local coniferous tree that drops its leaves in winter. They were all golden. We continued to follow the old road until it became a path and then it disappeared into the mountain laurel at the edge of the plateau. A bushwhack ensued to the edge where there were broken views of Rock Run’s gorge. We were able to follow a deer path along the edge with more nice views. 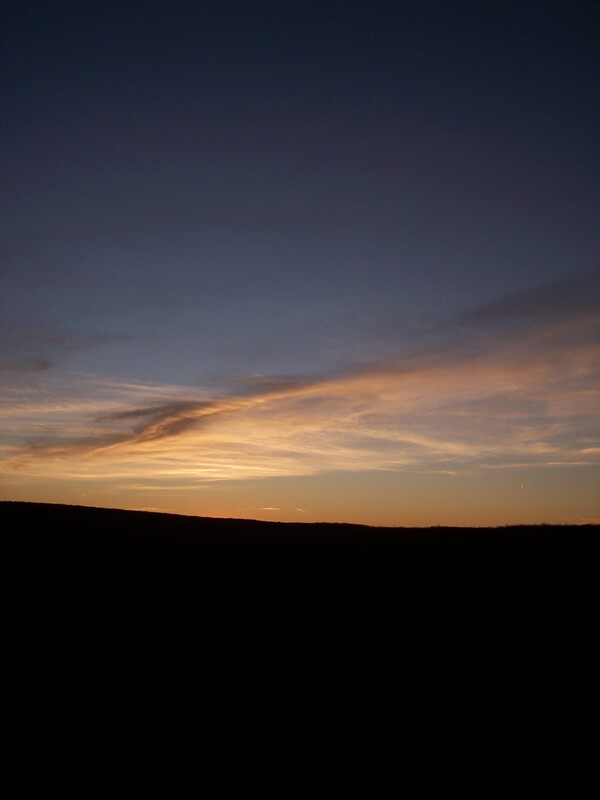 I began to hike back in the direction where we parked, staying at the edge of the plateau. We finally picked up an old trail and followed it to large ledges and rock outcrops. Some of the boulders were truly massive with narrow crevasses. This is an area where rock climber like to visit. We continued along the edge, passing a small seasonal stream and another huge cliff; from the top there was a view. We passed some mining ruins and reached McIntyre Road, and soon returned to the car. We then made our way to Band Rock Vista, with a commanding view of Ralston and the Lycoming Creek valley. The sloping buttresses of the plateaus were impressive. We enjoyed the views for a while and then headed back to the car. I hope to visit the McIntyre Wild Area again soon and re-explore Dutchmans and Abbot Runs with all their waterfalls; it has been about ten years since I’ve been to that section of the wild area. Every Autumn for the past several years, a group of my friends from college get together for a backpacking trip. 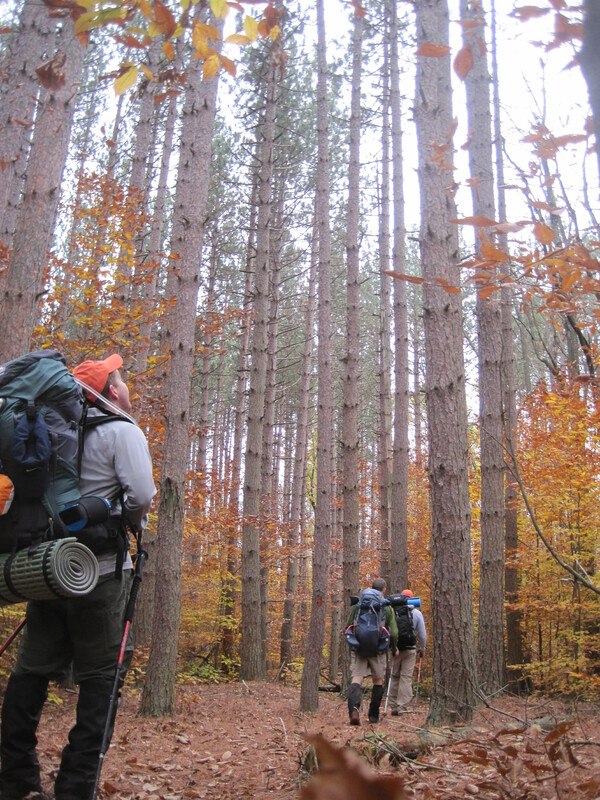 This year we decided on the south loop of the Pinchot Trail, located in the Lackawanna State Forest south of Scranton. The trail is about 25 miles long, but nearly bisects itself, creating a north or south loop. The north loop is more isolated, while the south loop features more diverse forests, streams, better camping, and an off-trail falls. I’d been on the Pinchot Trail earlier this year, and since it is fairly close to my house, it’s an ideal place to go for a long dayhike or an overnight trek. We met at my house Friday night, where we enjoyed a fire and views of Bald Mountain. We woke up on Saturday and got our gear together under partly sunny skies. We were soon on the road and we first drove to Big Pine Hill Vista, where there is an observation tower with 360 degree views. You can see Elk, Miller, and Bald Mountains. We drove to a parking area for the south loop, passing the main trailhead which was filled with cars. We began the hike, following the trail through rhododendron (or was it mountain laurel?) jungles and across a meadow at Balsam Swamp with tamarack in the distance. Much of the foliage in the trees were gone, but there was still a lot of color in the smaller trees in the understory. 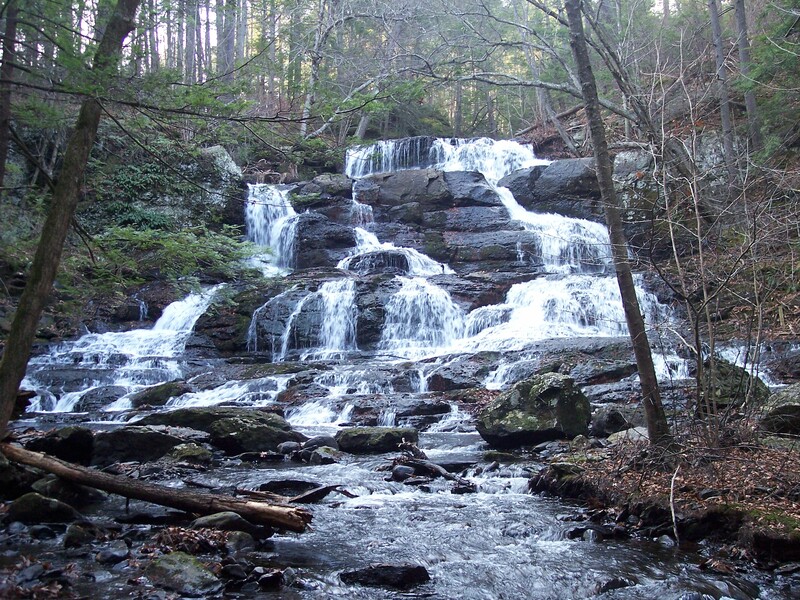 At Butler Run, we took a side hike off the trail to see Choke Creek Falls, where we relaxed for a little while. The group decided to push on to camp along beautiful Choke Creek. But I was concerned, the campsites along Choke Creek are the best along the trail and I have never seen so many people on this trail before, so I was worried they would all be taken. I pushed ahead of the group to try to get a site. I reached Choke Creek and the trail follows this stream closely, it is one of the most scenic sections of the trail. The first site was taken, and so was the second, but I was lucky with the third. We found a great site under spruce trees at a bend in the creek. A beautiful spot. We pitched our tents and relaxed next to the fire along the gurgling creek as darkness set in. Of all the times I’ve hiked the Pinchot, this was the first I actually camped at Choke Creek. We enjoyed the fire and made dinner, when a small mouse decided to stop by, looking for crumbs. He was persistent, but eventually left. We woke the next morning to sunny skies and a light mist hanging over the creek. We packed up and made our way up the trail, along Choke Creek, enjoying the sun and foliage. The trail soon returned us to our cars, where we changed clothes. After getting a bite to eat in Scranton, we were soon going our separate ways, until the trail call us together again.